We now carry LED Lenses and have them in stock for immediate shipment. Welcome to the Traffic Light Wizard's home page. To see our full line of products, go to the "Products" links on the left. We can now supply large orders of NEW Traffic Lights. Please inquire about quantity discount pricing. Click here to see our traffic lights in action! This 2 section traffic light does not come pre-wired in any way. It has a terminal block inside the housing that you can connect your 120 volt power cord to. Please call or email us for information on wiring and installing traffic lights. This 12" lens light is best suited for large indoor or outdoor areas. Have your traffic light convey a message or command. These custom lenses are poplular in bars, restaurants and are also used in production facilities for safety messages. This light is equipped with a 4 position rotary switch located on the housing. This model is the smaller of the two standard size traffic lights. It has 101 uses! We call it the "AS IS model because it is not custom wired in any way by us. Pictured wired to demonstrate that it works. Ships complete with a hanger & bottom cap. When ordering please select lens color/s. Discount pricing available on Red and Yellow 12" Glass Lenses in quantity. Polycarbonate (plastic) Lenses are also available. Click "View" to choose color and view pricing. Nothing commands attention like this Traffic Light Safety Sign! 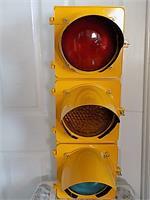 Vintage Refurbished 4-Way Traffic Light. 4-way traffic lights are very hard to find and highly collectible. This one has been refurbished with new paint and has all original parts. We added an aftermarket controller and power cord. This is a new (old stock) pedestrian signal with 12" Glass Lenses. This is a used traffic light in good condition. Lightweight and made of polycarbonate. This part can assist in hanging/displaying your signal. The picture is of 2 short arms with a flat hub ideal for mounting to flat surfaces and closer to the wall/structure your signal is mounted on. PRICE OF $99.95.00 IS FOR THE SET OF TWO PICTURED. This signal is completely refurbished with a new paint finish. Price is for one traffic light. This stand can hold and display your traffic light. It can hold a 12" lens traffic light or an 8" lens traffic light. It can also hold any size pedestrian signal. Comes complete with everything you need to attach your traffic light a top of it. This is an authentic pedestrian signal that has been customized with a sequencer and power cord. Plug it in right out of the box and watch it direct foot traffic! Traffic Light with 12" Specialty Lenses customized with your wording! This model is best suited for use outdoors or in large inside areas such as factories, warehouses, auditoriums, etc due to it's larger size. Now available with LED lenses! This LED lens will easily replace a glass or plastic lens in any US made traffic light that uses 8" lenses. LED Lenses use much less energy and are becoming the standard for traffic control and other uses worldwide. This light can be controlled manually with a 5 position switch that is mounted on the housing. There is an off position and an on position for each lens. Any combination of lenses can be requested. This is a single section of a traffic light. Order it with any color lens. $5.00 extra for a green arrow. These are great to use as caution lights or flashers. Check back often to see our latest shipment of lights and accessories. by clicking on the Wizard below. All traffic lights and traffic light controller equipment is used unless otherwise specified. Traffic Lights are guaranteed to be authentic and to function as ordered. All products purchased are covered by a 30 day return policy. If you are not satisfied with your purchase you have up to 30 days to return it to us for a replacement or a full refund of the purchase price.